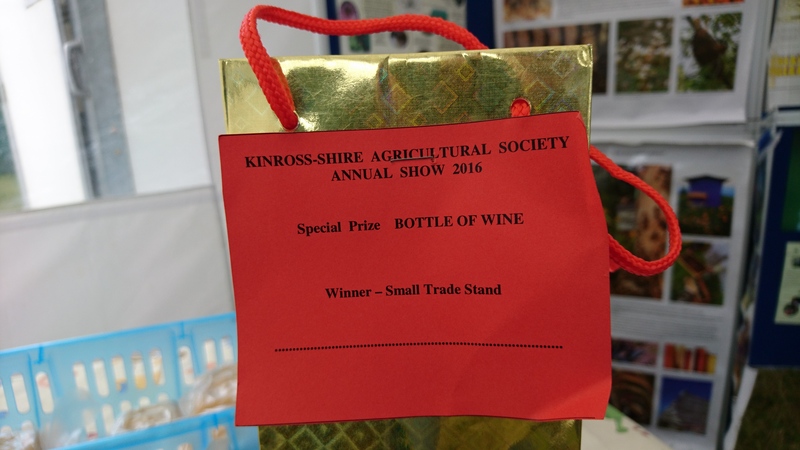 The Dunfermline and Fife beekeepers attended the annual Kinross Agricultural Show on Saturday 13th August 2016. We arrived on the Friday morning to set up our marquee but were met by strong and blustery winds which made it impossible to set up the stall and safely leave it overnight. However, the forecast for show-day was good and we were not disappointed when we returned early on the Saturday morning. Our dedicated team under Enid’s direction soon set to and we had everything in place with 2 well stocked observation hives. 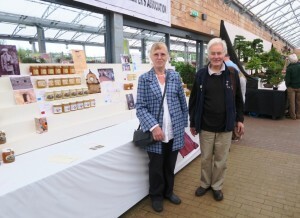 The show was a great success with many visitors to our stall. 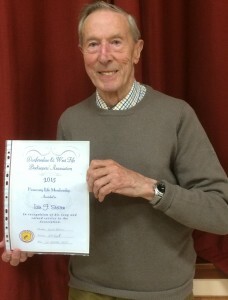 We were kept busy all day answering enquiries and explaining the work of the Fife and West Fife associations. 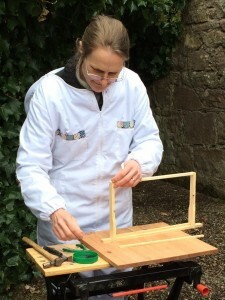 The 2 observation hives attracted a lot of interest and a model comb set up as a jigsaw with parts to represent what is seen on the comb was a favourite with visiting children and their parents. 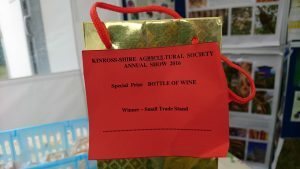 At the end of the show we were delighted to be presented with a certificate and bottle of wine for the ‘best small trade stand’ exhibit. Thanks to Enid for supplying all the materials and observation hives and to our helpers Liz, Sheila, John, Jeff, Janice, Kay and Bob. ……………..
continuing to live despite the spread of Varroa throughout most of Scotland. they went there to rescue the bees. certainly confirm that for this stock. 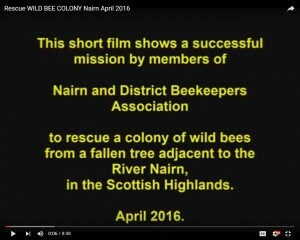 Information from the National Bee Unit. 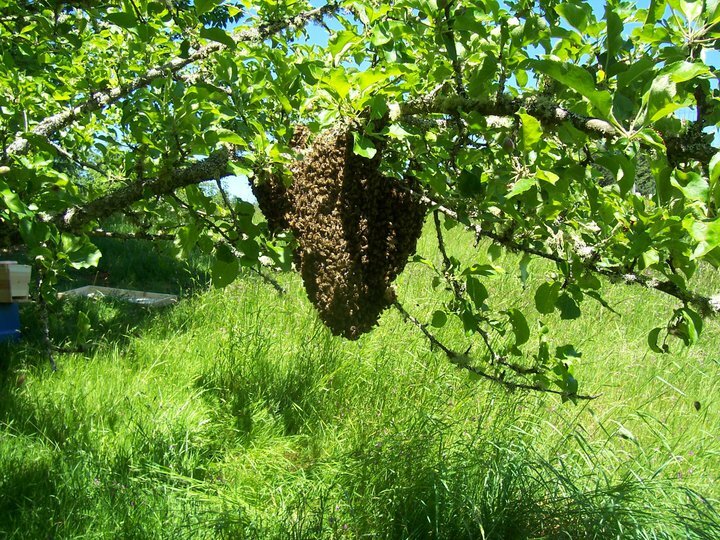 Beekeepers may wish to monitor their colony food levels closely over the next month as in many northern parts of the UK, the weather is still cold and foraging opportunities for large colonies are few and far between. It is important to check and monitor all your colonies feed levels, if you do not wish to open them up, lift below the floor, in turn, on both sides of the hive to see how much it weighs. Where the hive is light, liquid feed should be applied directly above the bees. Remove any supers from above the brood box which are empty or have few bees in them. This will help the bees get to the food quickly; Feed can be sugar and water mixed at 1:1 ratio or one of the proprietary ready mixed syrups available from Beekeeping Equipment Suppliers. More information about mixing up sugar can be found in the Best Practice Guidelines no. 7 http://www.nationalbeeunit.com/index.cfm?pageid=167 Fondant can also be used. 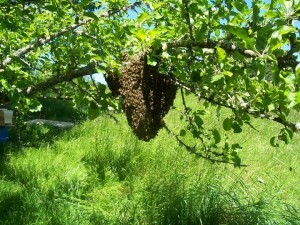 Large starving colonies of bees will take 1 gallon (approx. 5 Litres) of syrup very quickly while smaller colonies will take half a gallon (approx. 2.5 Litres). After feeding, heft the hives again and check the weight and if in doubt feed some more in a few days’ time. 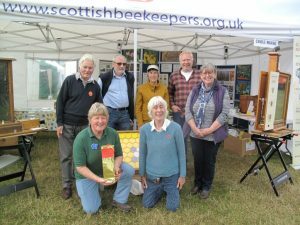 Bee Matters – Bees Matter! First, our summer programme – print out and pin on your notice board and/or write into your diary. It will also be on the website. You will see that as a general rule FBA meet 2pm on Saturdays and DWF 2pm on Sundays though there are a few joint demos which are the exception to the rule. Beginners are welcome to all meetings of their association except those for Intermediates. Mon-Sun 20-26 June Royal Highland Show Ingliston, volunteer stewards needed! 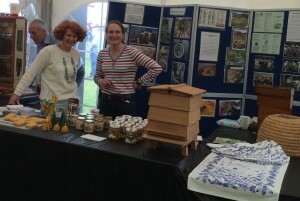 Sat 16 July FBA’s 100th b-day event St A Botanics, talk, demo, party – DWF invited! Sat 23 July FBA + DWF Lethangie, John Hendrie, BBKA president, to take demo. Phone numbers: for Muirside John Durkacz 01383 722 186; for Mawcarse and Lethangie Enid Brown, 01582 840 582 or 07763 809 367; for Balcaskie Janice Furness, 01334 880 469 or 07972 325 724; for St Andrews Botanics Enid or Janice; for Newton Bank Martin Kay 01334 828 187 or Enid. We will email before noon on the demo day if it is cancelled, so keep your eye on your emails if weather looks uncertain. 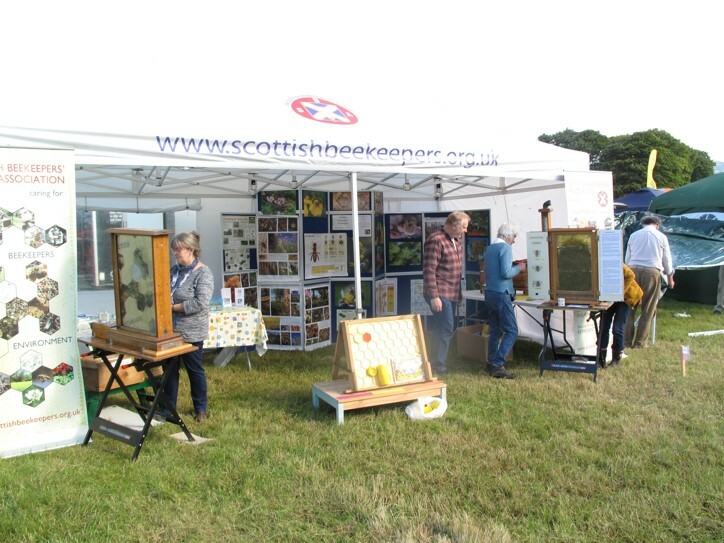 East Neuk bumblebee ID training day, Thursday 9 June, at Comielaw Farm, Pittenweem, indoor session in the morning and field exercise in the afternoon, finishing about 3.30pm. Contact Yvonne Stephan (Yvonne.Stephan@rspb.org.uk) if you’d like to book a place. 12 Nov 2015, The Times, Oliver Moody, science correspondent: Stone Age settlers had a taste for honey. Bees are among mankind’s oldest and closest friends, according to a study that has found that ancient farmers were using honey and beeswax at the dawn British agriculture…. Scientists have now found evidence that Stone Age settlements were taking honey out of beehives 9000 years ago, and that bees have been in this country for much longer than was thought … Fragments of Neolithic clay pots found beneath Eton rowing lake had demolished arguments that the Romans had brought honeybees to Britain ….They analysed 6.400 pieces of Stone Age pottery from more than 150 archaeological sites (in Ancient Europe and Turkey) and found that 81 had beeswax residues…. By Ruary McKenzie Dodds(BBC SPRINGWATCH’S ‘DRAGONFLY GEEK’) fell in love withdragonflies in 1985. 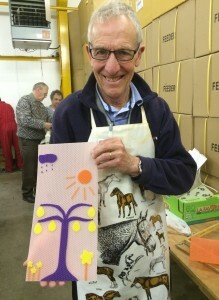 He ran a team of dragonfly volunteers for twenty-five years, and nowbroadcasts, writes and talks about dragonflies. His latest dragonflybook, The Dragonfly-Friendly Gardener, has just been published. He’sconvinced that everyone needs to know at least something about dragonflies, and their importance to the environment.